This is the place. Not so pretty, but it's a working farm that harvests fabulous oysters. What kind of chicken gourmand doesn’t like the fruits of the sea? Not me. They say “it was a brave person who first ate an oyster” especially if you think of oysters as the little boogers of the ocean. They definitely separate the seafood lover from the fraidy cat. The Hog Island Oyster company in the San Francisco Ferry building is a wonderful place to slurp down a icy platter of freshly shucked oysters as you kick back and ponder the oyster. I pondered enough that I had to see where these bivalves came from. There are no hogs and no islands involved as far as I could see. 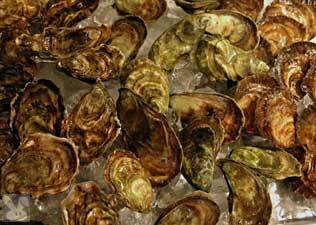 But, as far as the bivalves go, I am a hog when I land a few dozen of these puppies. No frills, just a super cool breeding ground for briny snacks. Even though this place is mostly for restaurant owners to shop, there is also a small retail shack for those of us wanting fewer that several hundred oysters. There’s a little picnic area too, but they charge a fee to use it and I’d rather just take that money and buy more oysters and take ‘em home. I got small Sweetwaters, Atlantics (known elsewhere as Bluepoints) and Europeans (same species as the Belon’s in France). They were all fabulous. Buying at the source saved money over going to a restaurant, I spent $40 for my assortment of 3 dozen. I could have spent less, but those “Europeans” were the priciest in the place. Even though the names (“Atlantics”, “Europeans”) make it sound like these oysters are shipped in from all over the place, they are all really grown fresh right there in Tomales Bay, several yards from where I bought them. The sweetwaters were firm and fleshy. The Atlantics were briney and had a wonderful plumpness to them, the Europeans were lean and flirted with a clam-like mouth feel. I made a simple mignonette sauce and everything was alright. A great way to see the coast and have a fun trip. If you can’t pry yourself away from the city, Hog Island’s restaurant in the Ferry Building has a “happy hour” Monday and Thursday from 4:30 to 7 p.m. during which they sell their sweetwaters real cheap (a buck each) and beer is $2.50 a pint.